Imagine a Fruity Pebbles ice cream cone. No, not a cone topped with Fruity Pebbles-flavored ice cream. 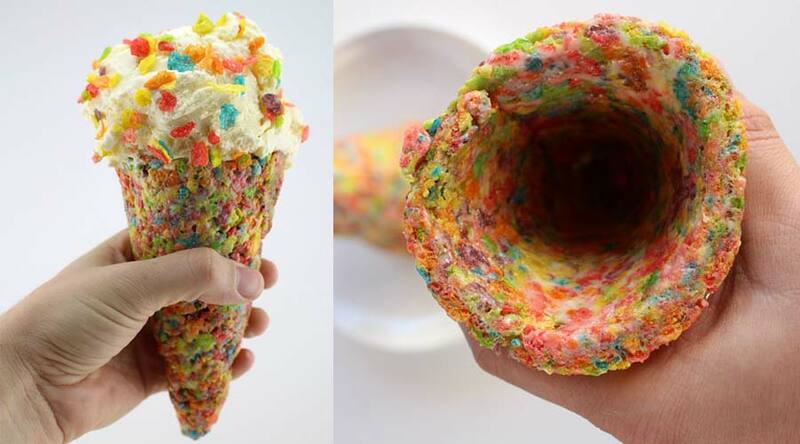 Rather, a cone made entirely from Fruity Pebbles cereal. That's what Nick from Dude Foods created. Following the recipe for his famous Rice Krispies Treat Ice Cream Cone, Nick replaced the rice cereal with a fruitier substitution. After melting three tablespoons of butter in a saucepan, marshmallows and Fruity Pebbles were added. Everything's mixed together and spread over wax paper. The mixture is flattened with a rolling pin and carefully wrapped around a cone form. Once it's hardened, feel free to serve with any ice cream you want. Nick choose plain vanilla topped with leftover Fruity Pebbles.